It is always fun to bake a cake and eat it too ! This time i celebrate my birthday with the DSB lovers in the form of a decadent, gorgeous and sensual chocolate cake which promises to bring out the “devil of decadence” in each one of you ! Presenting, Devil’s Dream Chocolate Cake 🙂 Enjoy ! 1 tsp cayenne pepper (for the heat and the intense flavour to offset the sweetness and enhance the bitter sweet nature of chocolate). If sugar and spice do not mix with your taste buds, feel free to exclude this ingredient and continue with the rest of the recipe. 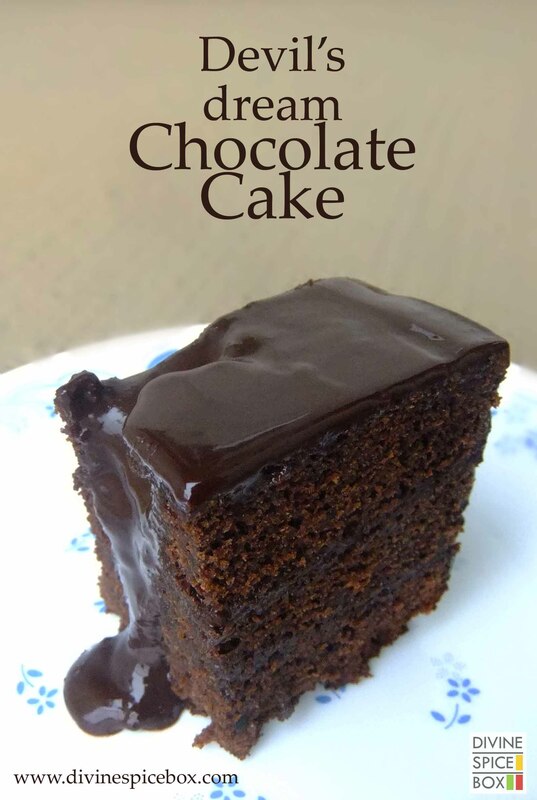 *Typically ganache needs whipping cream and chocolate but since i did not have any whipping cream, i used milk and butter to give the ganache volume, shine and form. This is a quick solution but worked fine with me and i made extra to store in a airtight container in the freezer. Does not freeze or get hard like rock. Stays good for upto 1 week in fridge and upto 1-2 months in freezer. We would begin with baking the dark chocolate cake base. Pre-heat your oven at 375F and keep ready to pop the cake in. Grease your baking tin with butter or line with a parchment paper and keep ready. Meanwhile, take a mixing bowl and sift in the flour, baking powder, soda bi carb, salt, cayenne pepper and cocoa powder. Combine and keep aside. In a separate mixing bowl, crack open an egg and whisk for a minute till the egg is homogenous. Add in the butter and sugar and whisk well till the sugar dissolves and the mixture starts to increase in volume. Add in the vanilla essence.You can do the same using a stand mixer at speed 2 for a couple of minutes. Keep aside. Now, take the espresso powder and dilute in 1/3 quantity of milk and microwave for 30 seconds to combine. Now, gently (1 tablespoon at a time), fold in the dry ingredients with the wet mixture and combine till it forms a cake batter. You need a pouring (but not runny )consistency batter. If you feel that the batter needs for liquid, feel free to add in a couple of more tablespoons of milk. Place the baking tin in the middle rack of the oven and bake for about 30-40 minutes or till done. Depending on the size of the baking tin and the depth of the batter, the baking time varies, so use your best judgement. It is advisable to check the status every 7-10 minutes after the first 20 minutes of baking. Carefully slice up the cake into as many layers as you can handle. I could manage making 3 layers. Keep aside. Take chocolate in a mixing bowl. Now you can either microwave this for a quick 30 seconds to melt or go traditional with the double boiler method. I prefer the double boiler method for chocolate tempering but it takes good 5-7 minutes to melt the chocolate. Once the chocolate has started to melt, add in the cocoa powder and butter and gently combine. In a separate pan, heat up the milk and pour in the sugar and mix well till the sugar dissolves. Tagged chocolate, Dessert, Gourmet, Winter. Gorgeous cake for your birthday! Cayenne pepper is something I need to try too, in a chocolate cake. Belated birthday wishes! Ooh waw, my friend! What a fantastic chocolate dream cake creation! It all looks stunning! Yes, but you always make Such tasty appetizing recipes! Awesome recipe…. I am a big fan of chocolate cake. One question in option of egg do I have to use any substitute or totally optional??? Hey I tried this cake last time but it didn’t rise . What could have been the reason ? Not beating the batter enough ? Less of baking powder ? I have the kitchen aid electric mixer .. Not the stand one . Going to try with that .. Any tips will be helpful ..can I try self raising flour ? If yes would I have to eliminate baking soda and powder all together ? Would be really nice if you could guide me on this . Planning to make one for my husband’s birthday tomorrow. Hi Sneha. I am sorry to hear that your cake did not rise well. Though i am not able to really figure out the reason for this, let me try figure it out. Maybe the baking powder was not enough. I never beat the batter as that would actually kill the air from the batter. Did you use eggs in the recipe? You can try using self raising flour but i would still use baking soda with it. Self raising flours usually have baking powder in it.